WESTBROOK MARINE PROJECTS offers a cost effective path to a new ship, yacht or boat design. 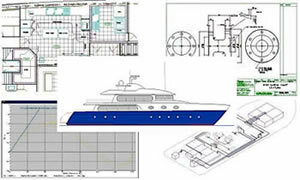 With our Naval Architect having over forty years experience in the design, construction and operation of a wide range of vessels including commercial sailing ships, high speed craft and hovercraft, we have a comprehensive understanding of the many aspects of the ship, yacht and boat design process. A wide knowledge of international Regulatory Authority & Classification Society legislation means all our designs meet construction, safety, pollution and manning standards. The pages on this website are just an indication of some of the designs we can provide, please contact us with your requirements. Our full and confidential design service is backed up with free telephone and email support. Click on Other Services to see a wide range of solutions we can provide to complement our designs.